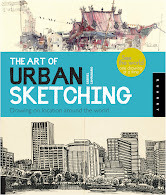 The Art of Urban Sketching is a stunning, comprehensive guide to on-location drawing. Authored by Gabriel Campanario, founder of the nonprofit group Urban Sketchers (www.urbansketchers.org) and a columnist for The Seattle Times, the beautiful, 320-page volume lays out the benefits of urban sketching for anyone willing to take up this highly rewarding creative pastime. This visually arresting, storytelling take on urban life from different cultures and artistic styles transports you to more than 50 cities, from Seattle to Sydney, spanning every continent and 30 countries. With profiles of leading practitioners and discussions of the benefits of working in this art form, this inspiring book shows how one can participate in and experience this creative outlet. The sketchers share the stories behind their drawings as well as the tools -- sometimes as little as a pencil and napkin -- and tips, such as how to sketch at night or on a moving bus, they utilized. Campanario encourages others to pick up his passion for on-location drawing, saying, "urban sketching is purely for fun -- a chance to step away from the computer and just draw for the sheer joy of it." ● Learn the manifesto behind a global urban sketching movement driven by artists drawing their cities and sharing their visual dispatches online. ● Be inspired by the artists’ stories about each drawing, how they worked, and the tools they used. ● Get expert sketching tips and learn how to approach various types of subjects by reading fascinating profiles of leading practitioners. ● Find out how to participate in and experience this creative outlet through modern-day social networks and online activity. Gabriel Campanario is a staff artist at the Seattle Times and the founder of Urban Sketchers (www. urbansketchers.org), a nonprofit organization dedicated to fostering the art of on-location drawing. Campanario’s newspaper column, “Seattle Sketcher,” was awarded first place for blog writing in The Best of the West Journalism contest and has been recognized by the Society of Professional Journalists and the Society for Features Journalism.